An enchanted world of friends, excitement and magic! Healthy, fun-filled days will translate into a very positive first experience away from home! The girls will make new friends, learn to share and help each other, respect differences, experience happiness and accomplishment. Greater self-confidence and a capability to adapt more easily away from home will help your child mature. A specially trained team of hand-picked counsellors ensures the physical and emotional safety of the children at all times. The 7 to 11 year old girls learn to function socially in a group and experience the joys of teamwork. New and exciting challenges ...on the waterfront! 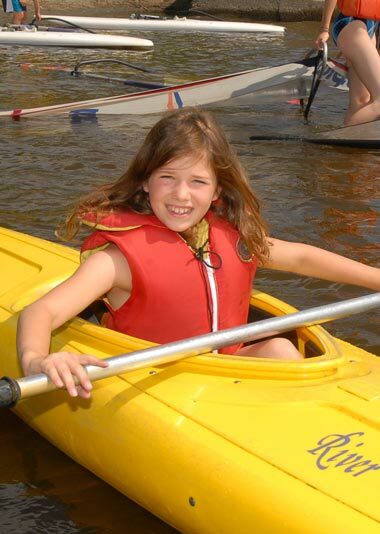 Life at camp for the 7 to 11 year old girls is filled with new learning experiences and challenges. Each child needs to know that she is valued, that she is unique and precious, that she is needed and that she is loved. The counsellors are there to ensure that everyone is fulfilled and happy. Once the activities of the day are over, the girls are always excited to know what the evening program holds in store for them. Mysterious and funny characters come to visit the Étincelles and share their adventures with them. Camp Claret, an experience through which each child builds self-confidence and a positive and happy outlook on life. It's not so much what we do, but how we do it, that makes the difference.